Happy Monday friends!! Hope everyone had a great weekend! Gary and I were able to get out for a little date night - more like one hour at a sushi restaurant near our house, but we knew with my mom leaving today it was one of our only chances of getting out - so we did!! Other than that, we've been getting out daily for walks and that's really wonderful! I'm not really doing a full face of makeup these days, but I'm doing my best to get ready, even if that means just wearing athleisure around the house! I thought I'd share my new 5 minute makeup routine! I am pretty pumped that the Sephora Sale is going on right now and opens to VIB members (aka I can finally shop it) on Thursday! I'm also sharing a few things that I'm going to try out / stock up on. I start with the Drunk Elephant Bronzi serum mixed with my Aveeno Moisturizer. This gives my skin a little glow, without needing bronzer. No surprise here, but I follow it up with the IT Cosmetics CC cream because it's my holy grail and I've gone through at least 10 tubes of it at this point! Concealer is my best friend right now and I'm on my second tube of the Maybelline Age Rewind concealer and seal it with Kat Von D setting powder. This has lasted me for 3 years and I'm finally ready for another one, but it does come in a mini size which I'm going to get because it's much easier to travel with. I skip the bronzer and add a touch of my Tarte Cosmetics Amazonian Clay blush. It lasts for 12+ hours without loosing it's intensity of color. Last step is the eyes, I use my trusty Jordana eyeliner (I get mine at Walgreens) and then add a swipe of my creamy eye shadow. I'm still using the L'Oreal Voluminous Lash Primer and the lash paradise mascara by L'Oreal and I'm all done! I've timed myself and this does take me just about 5 minutes. My final step is actually with my hair! I started using the new Batiste Dry Conditioner on my ends to keep my ends from looking dry and I don't have to worry about any buildup from in my roots! Here are a few things that I have in my shopping cart waiting for the sale to start for VIB members!! I haven't really used any palettes in the longest time, but I love the colors in the mini heat palette- especially the "wild thing"color. I'm repurchasing this primer because it's one of my favorites that I've used and it feels amazing on the skin. Not greasy at all and gives your skin a porcelain like finish before applying makeup. 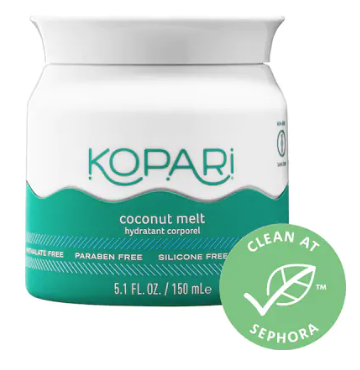 I've heard really great things about the Kopari brand and have been wanting to try their Coconut Melt for a long time - now is the perfect time to scoop it up! It's also part of the clean line at Sephora. This St. Tropez bronzing water mist has been on my radar since my favorite YouTuber, Lydia Millen talked about it. My friend Jackie used it and also swears by it now so I really cant wait to check it out. You don't have to worry about transferring the tan onto clothing or anything after because it dries immediately. Are you planning on buying anything during the Sephora Sale? What products do you use to make your morning routine quick and easy? I love Touch en Sol products! I haven't tried the primer yet though. Have a great week! I'm glad that you & Gary were able to get out for a little date! These are the perfect products for a quick feel put together face. Just right for a new mama! Yay for Sushi with Gary!! Been wanting to try some of these prodcuts! Thanks so much for the review! I'm so intrigued by that self tanner! I've never heard of it. I love the Maybelline concealer - I have the brightening one and I'm OBSESSED! That mascara combo is my current fave, too! LOVE an easy make-up routine! Cream shadows and that IT Cosmetics CC Cream are definitely part of my every-day makeup too! I've never tried the Nars Cream Shadow though--definitely need to check it out! Since becoming a SAHM, my makeup routine has been cut down to 5 minutes too, it makes it so much easier! I love #7 and #8! They're truly the best! And yes, I've had to cut down to a 5-minute routine when the boys are awake -- or get up earlier than them for a full face (or just go without). Good luck when your mom leaves. It will be an adjustment, but y'all will find your routine and will rock it! Such a great looking make-up routine. I use the same Tarte blush. Love their products! LOVE this sale! And yes to a mini face of makeup, I swear it's one of the things that kept me feeling like a human when I was running on zero sleep, just having that little routine in my day. Hope you guys have a great week! So glad you shared your favorites! My mom is VIB (somehow I've dropped down lol) so I'm going to use her code on Thursday. I use and like the Tarte Blush right now but I think I'm going back to my favorite Lancome blush! The Kopari brand looks awesome, might grab something there too. Glad you guys had a fun sushi date! That's such a good idea to continue to try and get ready, even if it's just wearing sweats around the house. The days that I was able to get a shower in made me feel so much better! Ohhh that mini heat palette looks so perfect!!! Not that I need ANOTHER Palette or anything. But still! This sounds like my Sunday routine when I don't need a full face of makeup. I think I am just going to get a few items I am about out of during the sale and not go crazy. So the Kopari intrigues me!!! Mastering the 5 minute makeup is a game changer with a new baby!! That palette has so many pretty colors! I love that you can have your makeup routine down to five minutes if need-be!! This summer since I stayed home with the kids for the first time ever I was able to shorten my routine, too, and it was really nice not having to spend as much time getting ready each morning! I’m impressed that you’re doing any makeup with a newborn at home! 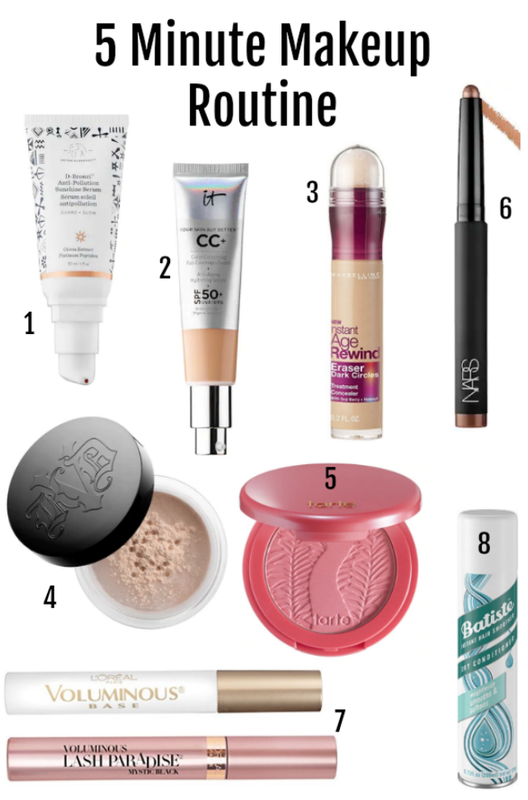 Gotta love the cc cream and the age rewind concealer - two of my everyday go-to’s as well! I need to nail-down a 5 minute face -- you never know when you might need to rush and get ready. I'm glad you and Gary had a little date night, I bet y'all are enjoying being parents! I just purchased number 3 since I had heard such good things about it.. I am not a big make up person. That primer looks good too.. will check it out. Glad you were able to sneak out for a little date night. Love the primer and concealer! I will be honest: the Kopari is great in that it travels well, but it's just pricey coconut oil! yay for a date night!! I picked up some of that dark circle concealer today at Walmart..thanks for the recommendation! Also, the Naked Smokey palette was one of the best purchases I've made. I'll never go back to small, individual eye shadows! Il have to try some of these! Thanks for sharing! I'm looking for a new primer so I'm going to look into that one! And I love st tropez products!!! My summer tan is starting to fade so I'm about to start using my st tropez! A bunch of these are in my make-up routine. I love my No Poreblem. I use that daily. The It Cosmetics foundation is awesome. I use a lot of the products you use in your 5 minute routine, too! 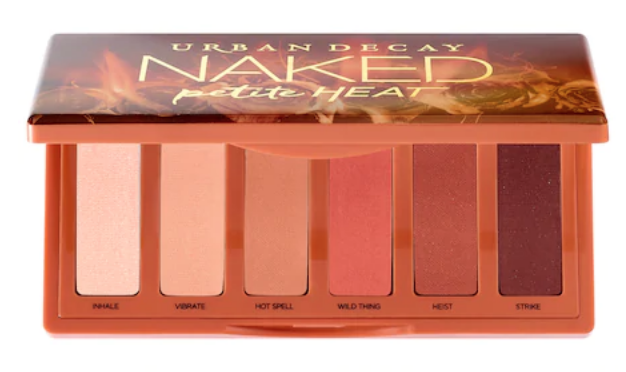 Had not seen the mini heat, I'm thinking about getting the ABH Soft Glam palette and need to dwindle the rest of my cart down. Can't wait for Thursday! I love a lot of these! If I can't get my makeup done in 5 minutes most of the time now then it just doesn't happen haha! I cannot wait for this sale- and that Maybelline concealer is the JAM. I use it everyday! i am with you on the IT cosmetics CC cream. it's my favourite product ever, i love it! i have like 6 backups just in case of.. i don't know, a zombie apocalypse lol. i'm also obsessed with tarte blushes! I have that Kopari coconut melt and have enjoyed it so far! I want to check out more products from their brand! Such a great round up! I am so antsy to shop the Sephora sale too! I'm so tempted to try that Drunk Elephant product - I've heard such good things! I'm picking up a few of the Fenty foundations (obsessed!)! The perfect 5-minute makeup routine! And yay for getting out for a few! I love a quick routine, and you always know the best products! This is such a lovely guide dear. I love your picks. Thanks for sharing! Yes! some of these products are my literal go-tos! You always look flawless! I'm so happy that you and Gary got a chance to get in some alone time, I know that must've felt good! One of the great things of having a summer baby is that you're able to get out more often and enjoy the weather (when it's not too hot). Those products are so good. I've used that Maybelline concealer for a few years and loved it and I LOVE Tarte's blushes. Thanks for sharing and I hope you're enjoying your holiday weekend!